Luxury, 3 level contemporary home of 3,000 sq. ft. located in Cranmore Birches on a private cul de sac. This spacious open floor plan with kitchen, dining and living room connected is perfect for entertaining families and large groups. The living room has a fireplace, flat screen TV and DVD with surround sound. On the Main level is a half bath as well as the master suite w/ King size bed and private bathroom with shower/tub. Upstairs are two bedrooms with 3 queen size beds and one full size bed with access to large hall bath with shower/tub. Located downstairs in the basement is the 4th bedroom w/ two queen size beds and access to a full bath w/stand up shower. There is also a full size game room equipped with pool table, flat screen TV, couch, bar stools and pub table for lounging. This room leads directly outside to the hot tub and makes a wonderful refuge to experience the beauty & charm of this small quaint Village of North Conway. Master bedroom is located on the main level with its own private bathroom. All bathrooms are spacious and located on each level. No Pets and No Smoking Allowed. DirecTV is the provider for satellite service. There are 2 flat screen TV's. One is located in the living room and the other is located down in the basement. There are also 2 additional TV's with a DVD player in one bedroom upstairs and one bedroom downstairs. Our house has surround sound throughout including screened-in porch and hot tub area. There is an ipod adaptor to our surround sound. Parking - 2 cars can park in the garage and 4 cars will fit on driveway. Cranmore Fitness Center located nearby with public access. House was beautiful and exceeded all of our expectations! Great house with plenty of space, fully equipped and nice furnishings. The pool table and hot tub were the perfect apres activities. We thoroughly enjoyed our vacation! This is a lovely home, with everything you need. We stayed there with two of our children, their spouses, and our grandchildren. One suggestion we have is if you have young, crawling children, bring a gate to put at the bottom of the stairs as they are located in the main room. Our youngest is fascinated with climbing stairs, but doesnt know how to come down! Tammy answered any emails immediately before our trip, and the directions to their home, and how everything worked were easy to follow. The family agreed it was the nicest place we have stayed in in North Conway, and would love to go back. The home was clean, and the linens were a good quality. The location was great, close enough to town, and with a very private yard. This is a wonderful place to stay, and plenty of room for a large family. Thank you Tammy! The pictures do not do this house justice - it is very spacious and has a nicely equipped kitchen. Our grandsons loved learning how to play pool and the hot tub. North Conway and the area are full of activities such as tubing, hiking, swimming (Echo Lake was lovely), mini-golf, the cog railway, etc. I believe that this is largely a ski house so there is limited outdoor space but the small screened porch with the smell of the evergreens was a lovely place for reading and morning coffee. It was a bit hard to find in the dark when we arrived later than anticipated. Perhaps some more specific directions such as how many houses in on the street would be helpful. My only concern was the grill on the screened porch. We did not use it because my husband thought it was not safe in an enclosed space like that. Perhaps putting it in the garage and allowing it to be used in the driveway? Anyway, other than that, I have no complaints and highly recommend the house. 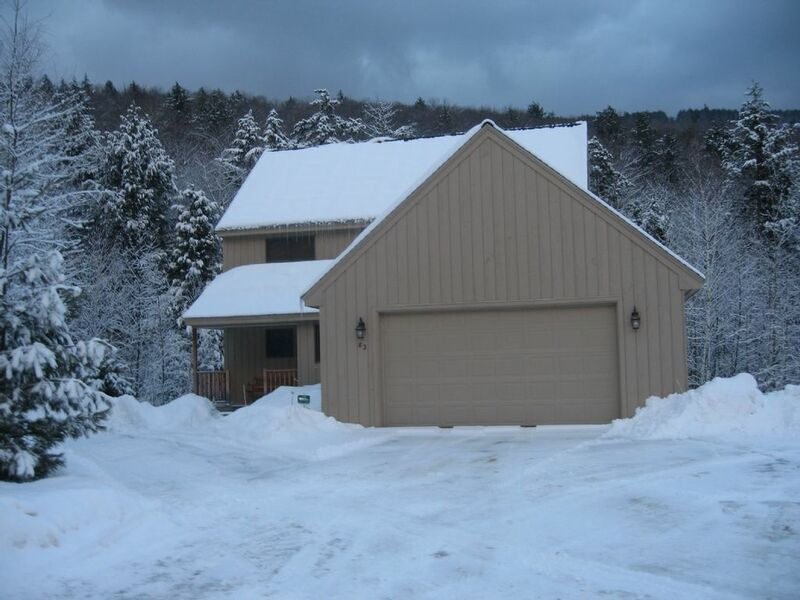 Mountain setting, Situated just 1/2 mile from the Village of North Conway and only 1/4 mile from Mount Cranmore (skiing, tubing and family fitness center), 20 minutes to Wildcat and Attitash Ski areas, 5 minutes to echo lake and 5 minutes to Saco river. StoryLand, hiking, climbing, swimming, canoeing and outlet shopping are all within 10 minutes. The North Conway area features attractions for the whole family including winter sports, golf, mini-golf, alpine and water slides, mountain biking, and scenic train rides as well as fine dining, theater and night life.